School Loop Plus has an attendance option available and can be implemented by updating the data import process. We can work with your district to set this up. This feature only displays attendance activity and cannot be used to record attendance. For schools using this feature, attendance information is displayed on both student and parent accounts as well as on the student record page for teachers and administrators. 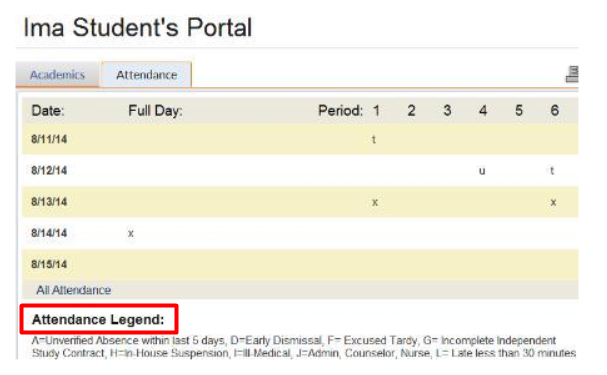 School administrators are able to create a legend for the attendance codes (e.g. A = Absent). The legend appears at the bottom of the attendance section in the student record and also appears at the bottom of the page showing all attendance. For more info on how to set up attendance, go to Attendance Setup (Plus).